Like any other sport with a long history, lawn bowls has its own distinctive mode of clothing which is rooted partly in the tradition of the game and partly in the requirements of players to have bowls clothing which is comfortable to play in and easy to maintain while retaining a smart appearance. Bowls World sell a full range of bowls clothing for indoors and outdoors including bowls trousers and skirts, bowls blouses and shirts, bowls knitwear and jackets of all kinds, wet weather clothing and shoes. Our range is a handpicked selection of clothing from top manufacturers such as Emsmorn, Taylor, Henselite, and Drakes Pride. It’s a notable feature of the game that bowls players and clubs alike take great pride in maintaining standards of dress, and each club and competition will specify its own particular variations of dress code. While some may dismiss this type of conformity as simply being outdated, the same sort of high standards of behaviour and dress apply to many other traditional but very current sports, such as golf, cricket and tennis. In fact, owning and wearing the proper bowls clothing can actually help a player’s discipline and focus. Changing into dedicated clothing, even for informal play, sends a strong signal to the player and those around them, that they are here to play bowls and that they mean business. The traditional etiquette for bowls clothing is for all items to be white: skirts, blouses and shoes for ladies, trousers, shirts and shoes for men. The traditional colour for shoes is actually brown, but white has become a lot more standard in recent years. While this remains the guiding principle, etiquette has relaxed significantly over the past few decades. Ladies are just as likely to wear trousers as skirts for play these days, although skirts may still be required for particular occasions. And grey has become an acceptable alternative to white, although certain clubs or competitions may still insist on white at certain times. In general, the more formal the occasion (e.g. the finals of a major competition) the more traditional the dress code will be. But whatever the level of formality, and whatever variations in colours or styles may be permitted, players are expected to conduct themselves in a way which is courteous and respectful to others, and this includes dressing in a way which is modest and unlikely to be distracting to other players. This will include, for example, anything too brightly coloured, anything too restrictive or revealing, high heels, track suits, tee shirts or cross trainer shoes, and if a man is wearing trouser braces they must not show. Adhering to a dress code, therefore, is not just a matter of convention for convention’s sake – it is seen as a matter of fair play. Which is why some variations in dress, which a non-bowls player might think completely trivial, sometimes spark such intense feeling and controversy within the game. In practice, a bowler will require a range of bowls clothing items in order to meet these variations in dress code requirements. 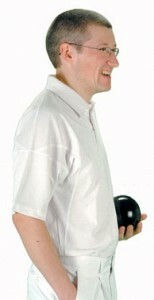 Most bowlers will possess a minimum of two pairs of trousers and/or skirts, one white and one grey. Ladies involved in competitions are likely to have at least two skirts and two pairs of trousers. Shirts – for men or ladies – are generally white, although trim colours have become more common in recent years. Different clubs will have different policies regarding the acceptability of different types and colours of trim. And, of course, a player will need at least one pair of smooth soled shoes, but as before may choose to have a different colour option for different occasions. A formal shirt and club tie is still sometimes required to be worn during match play, and when this is the case it is required that you do not remove or even loosen the tie until the match is completely finished. Increasingly, the use of the club tie is being replaced by polo shirt style tops bearing club insignia. Here’s an overview of the clothing supplied by Bowls World. For playing indoors you really only need a set of smooth soled bowls shoes, a suitable shirt or blouse and a pair of bowls trousers or a skirt. For the ladies we supply one model of skirt and two models of trousers (full length and cropped), all either grey or white and in a wide choice of sizes. We sell seven styles of ladies blouses – the Pique, Zippy, Vee, Iona, Brora, Orion and Melrose. All are short sleeved and white (except for the Orion which has a choice of trim colours) and have varying necklines. And we currently offer 11 styles of ladies bowls shoes including lace ups, slip ons, trainer style and sandals. All are available in white, with some models also in grey and/or tan. Sizes 3-8. For the men we supply four types of full length trousers and a pair of white shorts (and, if required, a leather belt or a set of braces). We have nine styles of men’s bowls tops to choose from. Five are completely white, while four have varying types of coloured trim. And there are 11 types of men’s bowls shoes in our current range, including lace ups, slip-ons and trainer style. All are available in white, with some models also in grey and/or tan. Sizes 6-12. On clement days your indoor bowls clothing will also suffice for outdoors play. But as soon as the weather becomes more extreme in any direction â€“ either cooler or wetter or sunnier – you will need additional outerwear to protect yourself from the elements and enable you to keep playing. Once it was the case that rain would stop a game of outdoor bowls, but not anymore. With more and more fixtures to be fitted in, the option for postponing matches is severely reduced and players are often required to play in all weathers – which means having the correct clothing for any weather is essential. As someone once said: “There’s no such thing as bad weather, only the wrong clothes.” At Bowls World we can supply clothing to deal with all weather conditions: knitwear and jackets for the cold, waterproof clothing and hats for the wet, and headgear for the sun. To protect against the cold, we provide men with a choice of nine different pullovers, slip-overs, sweatshirts and jackets. Our ladies range offers a choice of 3 different zip up jackets and a formal blazer. For waterproof outerwear we provide ladies and mens jackets and trousers in either Drilite or Ventilite fabrics, and a selection of rainproof hats and caps. And for sunny weather we provide a full range of sun hats, caps and visors, to keep the sun out of your eyes whilst playing.